The right and wrong ways to park a VeoRide bike. FAYETTEVILLE, Ark. – Dockless bikeshare systems such as VeoRide are the ultimate convenience for riders. Parking is easy and flexible but it's important to put your VeoRide bike at a rack when you're done riding. Parking at a bike rack will help keep our sidewalks clear and our campus looking it's best. 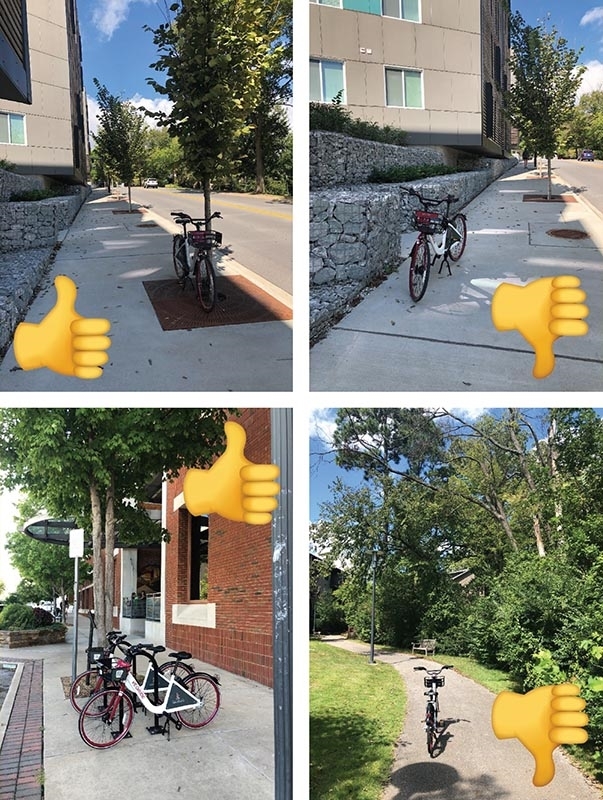 Office for Sustainability has offered a few examples of how bikes can be parked properly and improperly. When parking at a bike rack you can also be sure you won't be assessed a retrieval or rebalancing fees on your VeoRide account. If a bike is reported for being parked inappropriately users may receive a message advising better parking habits and fees can be assessed for repeated complaints. If you see a VeoRide bike parked somewhere it shouldn’t be there are a few things you can do. You can report it to VeoRide through the app to receive free ride credits or call the customer service number listed on the basket. You can also roll the bike to a better spot if you feel like doing so.